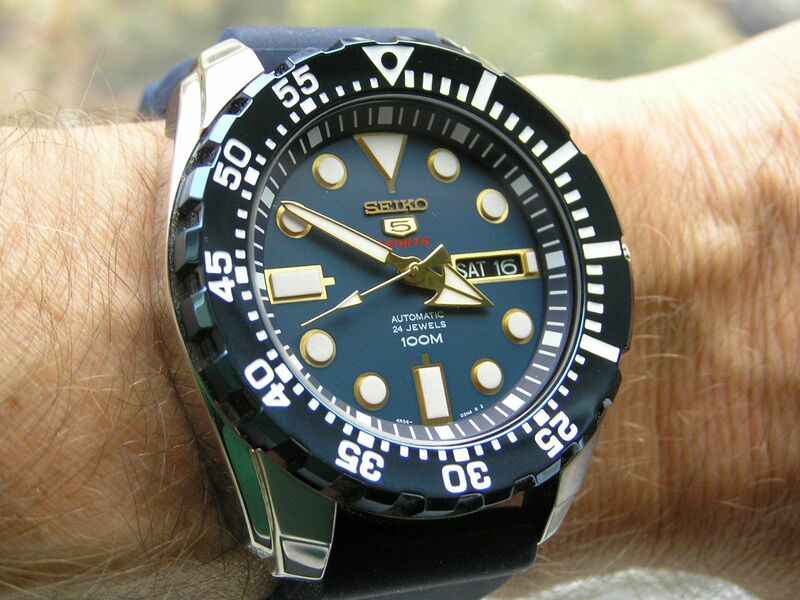 It has been quite some time since I have reviewed a watch made by Seiko, so I thought it would be nice to showcase one of their newer models this time around. 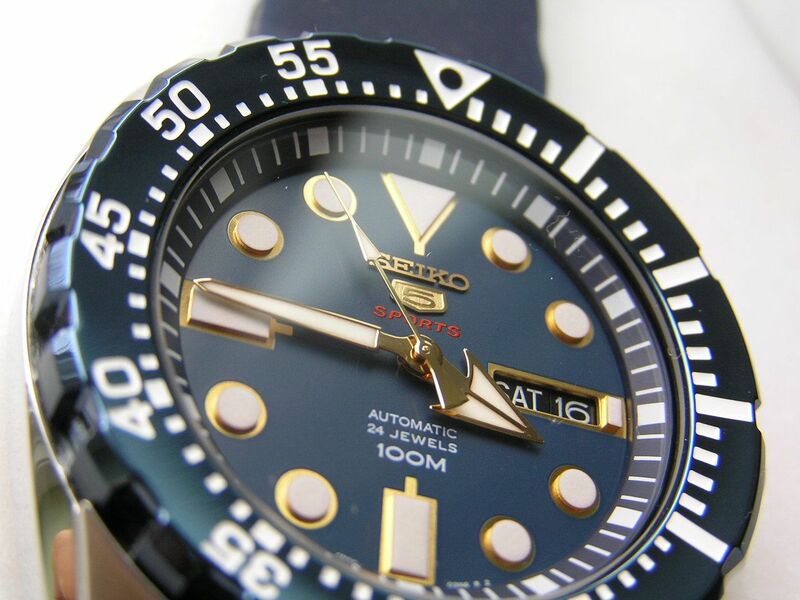 So much has been written and photographed about Seiko over the years that of course, the brand needs no introduction. Known the world over for robust, reliable and value-oriented watches, the Seiko brand commands respect pretty much anywhere you go. I don’t know exactly how many Seiko watches I have owned over the years, but it probably numbers around 20; not an immense amount by any measure, but certainly enough to have a good feel for the brand. 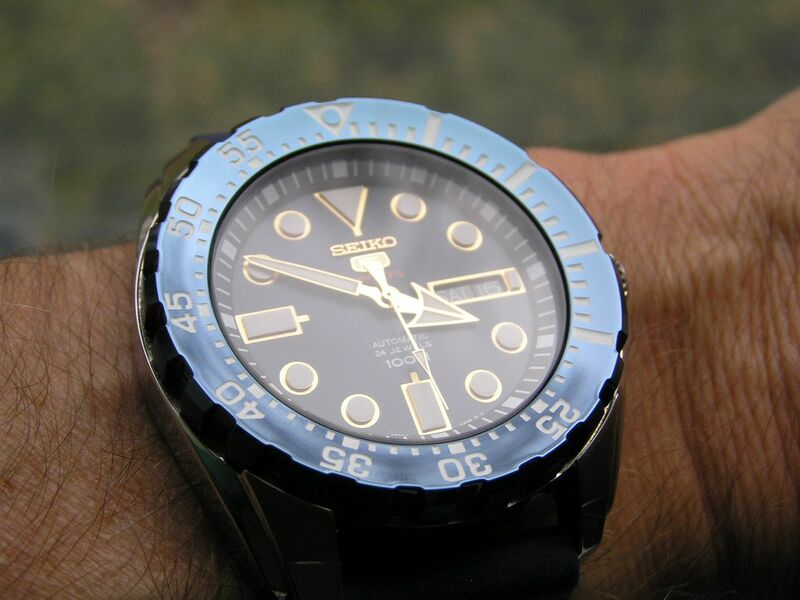 Probably the best-loved Seiko series among watch aficionados is their Seiko 5 line, which has been augmented in recent years with the Seiko 5 Sports line. The Sports watches build upon the attributes of the traditional Seiko 5 line up with ‘Explorer’ or ‘Marine’ models that add rotating timing or compass bezels, larger hands and a myriad of colorful dials, straps and case finishes. The range of the entire Seiko 5 Sports lineup is extremely varied. 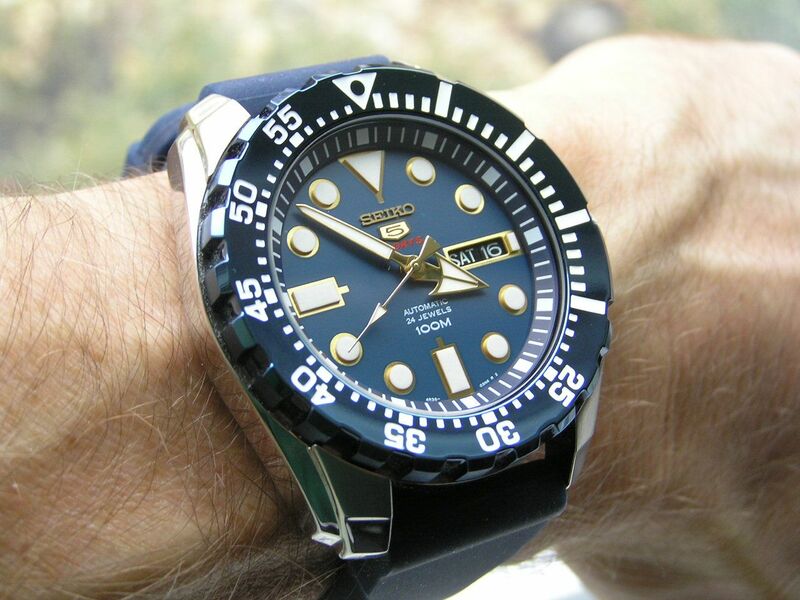 What I like about the Seiko 5 Sports model reviewed here is its resemblance to the popular ‘Monster’ models. It has the same (or very similar) hands, a slightly smaller but still bold bezel and less water resistance, but it also carries a lesser price, especially when purchased at a discount. This particular model also has a striking resemblance to the limited edition blue Monster that has long since been sold out. 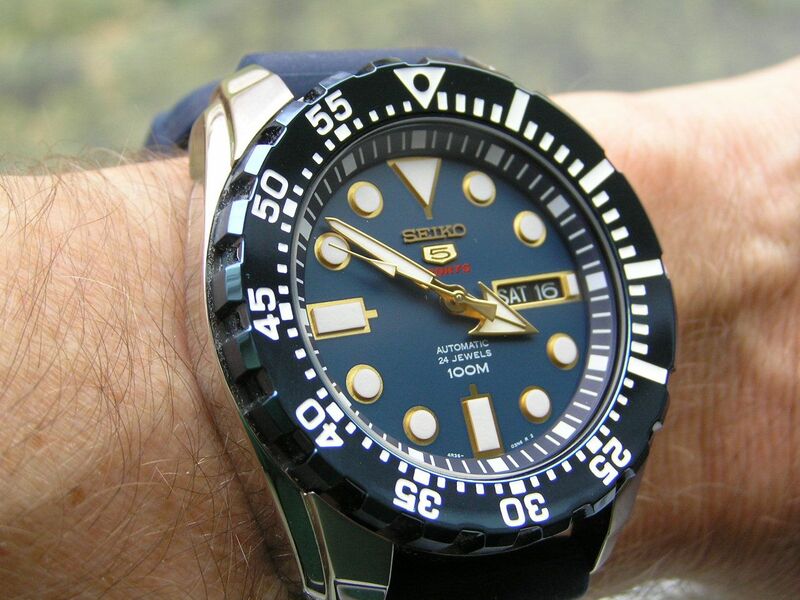 This Seiko 5 Sports starts with a fully polished stainless steel case (save for small brushed areas on the tops of the lugs) that measures 44.7mm without the knurled crown; 47.8mm crown included. Lug-tip to lug-tip measures 50.9mm. Case thickness is 12.7mm and lug spacing is 22mm. Appropriately sized without being clownish. The screw down case back is a display type with a polished stainless steel edge. Various wording is printed in black on the display crystal which makes this printing a bit hard to read at times, but it’s the back of the watch, so it really doesn’t matter. The case finishing between the lugs is good, but the finishing on the inside of the lugs is a bit rough, but this is par for the course with these watches and given the price point, acceptable. 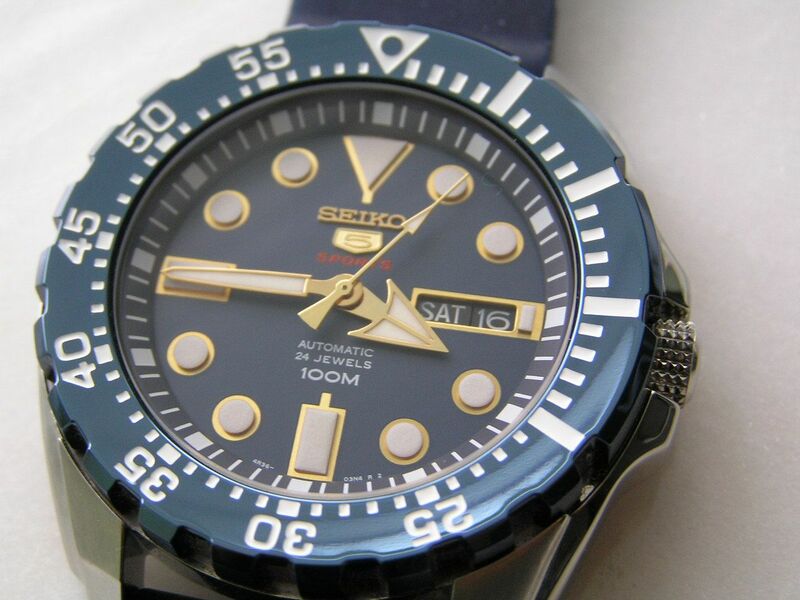 Believe me, I have seen far worse finishing in these areas on watches costing much, much more that this Seiko 5 Sports. 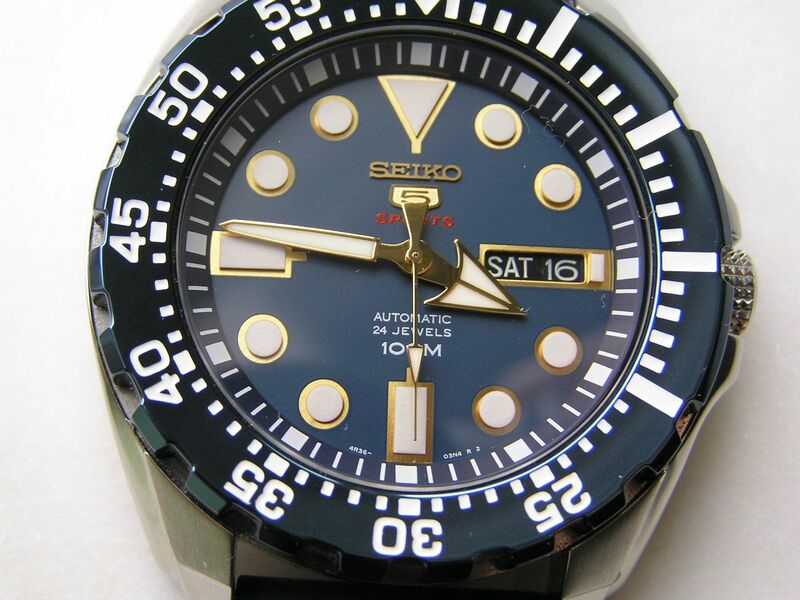 Overall, the case fit and finish is very good and keeps Seiko’s reputation for value on-point. 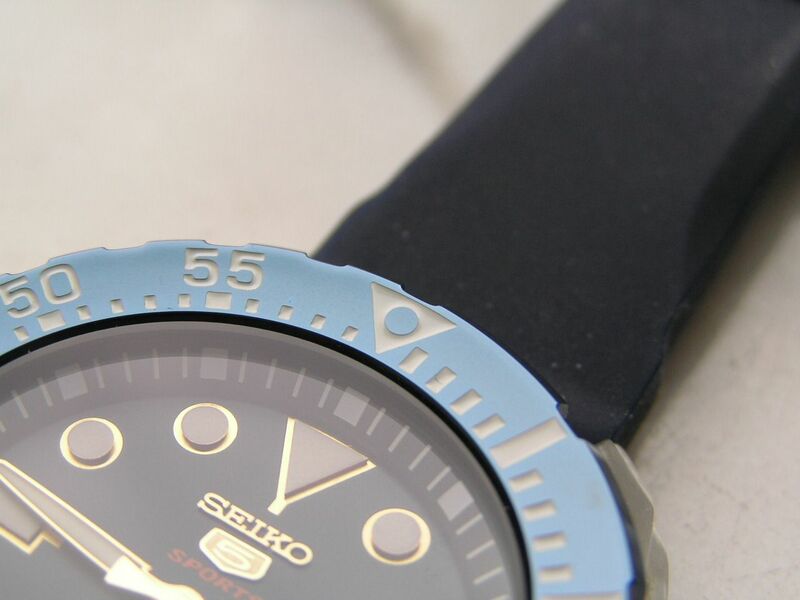 This Seiko 5 Sports is factory rated for 100 meters of water resistance. 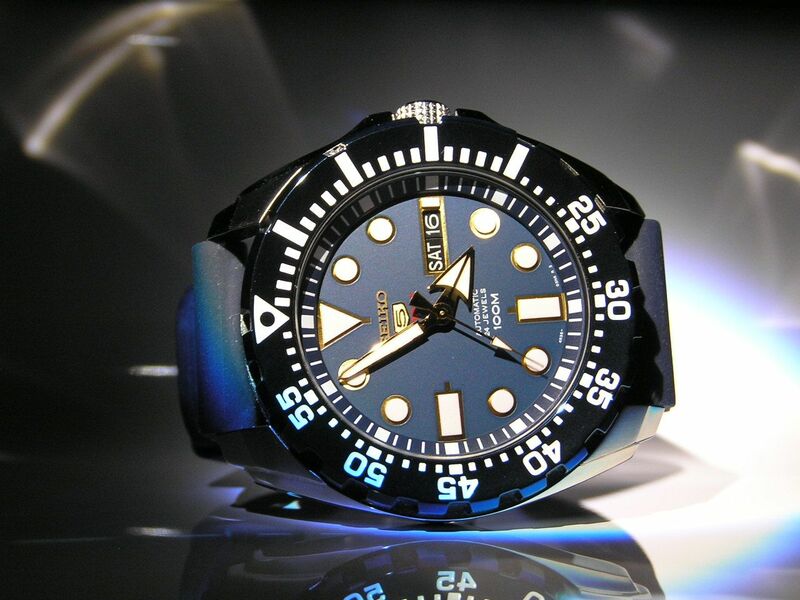 What I like most about this model is its superb dark blue matte-finish dial. The dial color looks great and with the gold handset, the look is one of class, without losing its sporty pretensions. The handset is largely the same style as a Monster; in this model the hands are gold with infill lume. The hour hand is a stubby, wide arrow, while the minute hand is rather long but not overly slender. The center seconds hand is a gold stick with a flair on the pinion end and a long pointer tip with lume on the business end. The markers are a mix of round and rectangular and are placed on top of a gold background with a gold edge around them. The effect is nice, with the markers having a 3-D look to them. 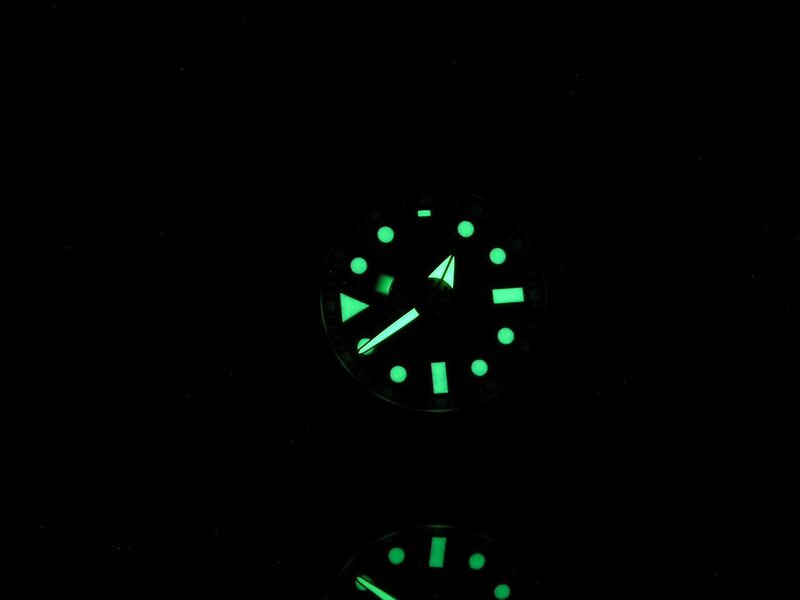 The markers and hands are luminous, and since the lume material is Seiko’s proprietary LumiBrite, the lume quality is excellent, as is to be expected. There’s also a chapter ring on the outer edge of the dial with minute markers in white; the markers for each five minute mark being wider than the others. A quickset day/date window is located at the three position. The day and date wheels are white on black. The day wheel is English/Spanish and all days are in white except for Sunday, which is displayed in red. Setting is accomplished with the crown pulled out to the first position; move the crown clockwise (up) to set the day and counter-clockwise (down) to set the date. Alignment of both wheels in the window is good. A fair amount of printing is present on the dial, but since the dial is a dark shade of blue, the printing doesn’t detract from the legibility of the dial. Under the 12 marker is an applied ‘Seiko’ in gold, with an applied ‘5’ logo beneath and the word ‘SPORTS’ in red below the ‘5’ logo. 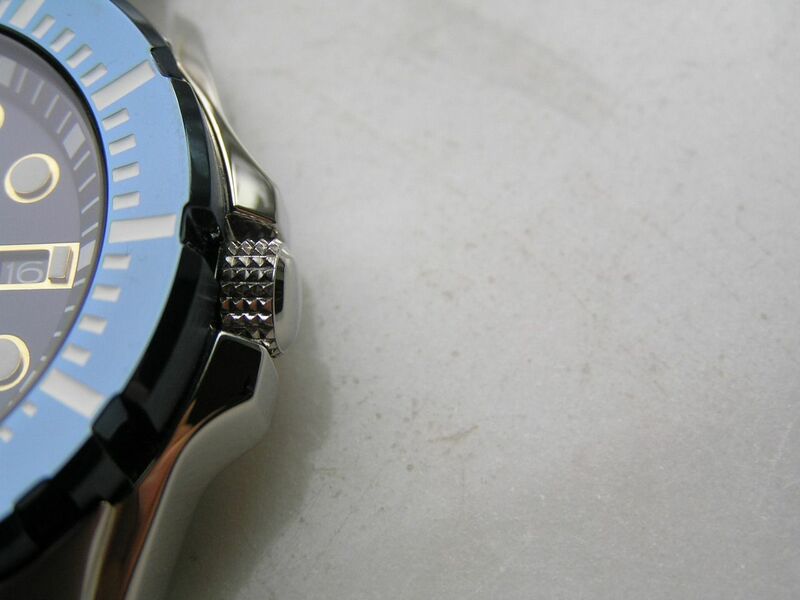 A great looking blue ion-plated unidirectional bezel encircles the dial. 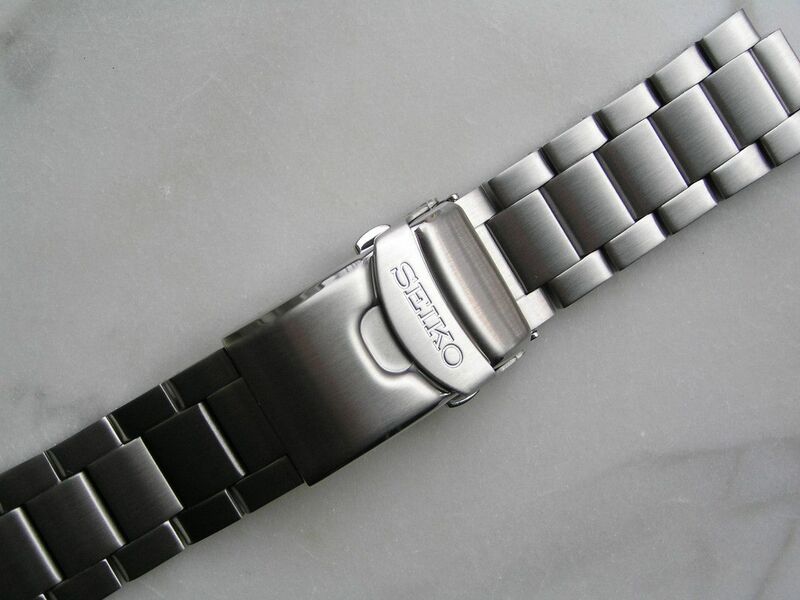 The bezel has infilled white markers and arabics, but nothing on the bezel is luminous. The bezel is a 60-click variety, even though you can hear and feel a click between each detent. The action is smooth, but the bezel rotates a bit too easily, which sometimes lets the bezel rotate unintentionally when worn, which can be annoying. It’s not super loose, but I have found myself checking it when I wear this watch, since I like my bezels to line up at the 12 mark when I’m not using them to time something. Demerits here for this minor infraction. The crystal is a flat mineral crystal, what Seiko calls ‘Hardlex’, which is the company’s proprietary hardened mineral crystal. No complaints here and for at this price point, it’s what you would expect to find. 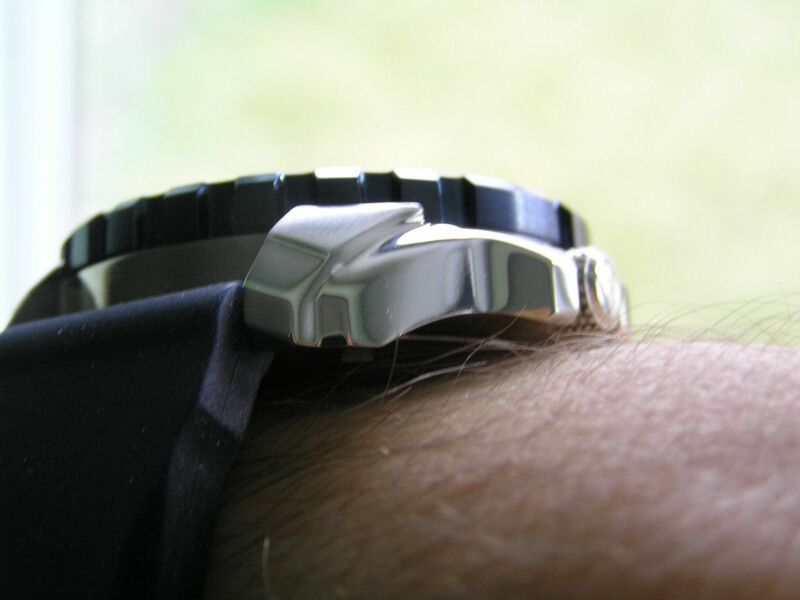 The crown is unsigned and has nice knurls on it to aid in winding and setting the watch. Due to the size of the crown (a bit undersized to me) and the crown shoulders on the case, it can be a bit difficult to wind or pull out for setting. Thankfully, the crown does not screw down, so there is no issue with getting a too small crown to screw down. Build quality is fine, with no dirt or defects noted under my standard 8X loupe exam. Pretty impressive for this price point, which by now is a popular refrain in this review. 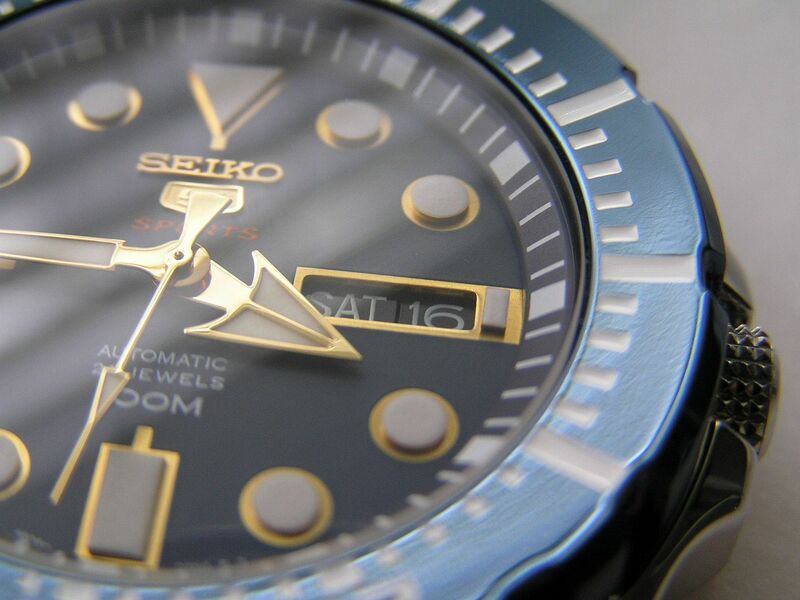 The automatic movement inside the Seiko 5 Sports is the company’s newer 4R36A (the ‘A’ simply means it’s the first generation of this movement) which was introduced almost five years ago. This 4R36 is a big step up from the venerable and ubiquitous 7S26 movement found in so many Seiko 5 watches. In addition to having 24 jewels, the 4R36 hacks and can be manually wound. Finally! 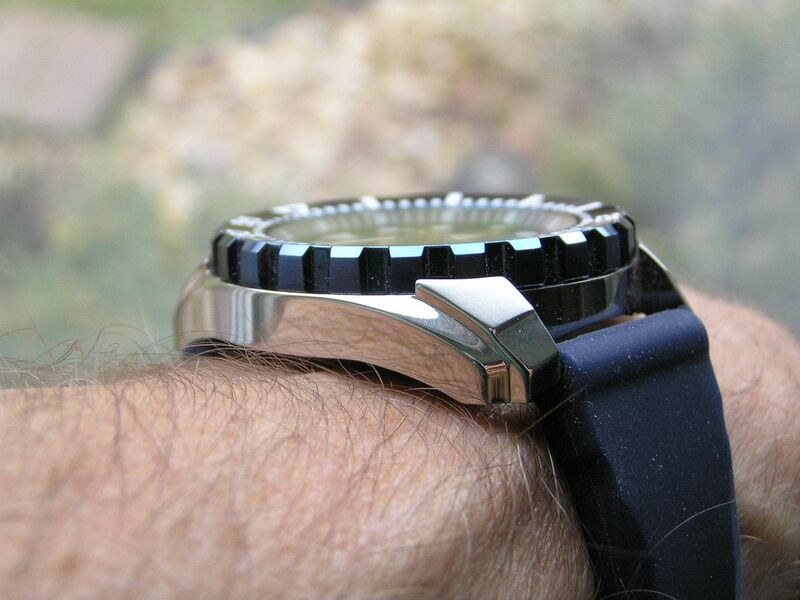 These features make owning and wearing this watch worlds better than a non-manually windable movement. I have been unable to ascertain the country of origin for this movement, I believe it may be Malaysia, but it really doesn’t matter, as the movement is a good one regardless of where it’s made. The 4R36 runs at a temperate 21,600 bph. 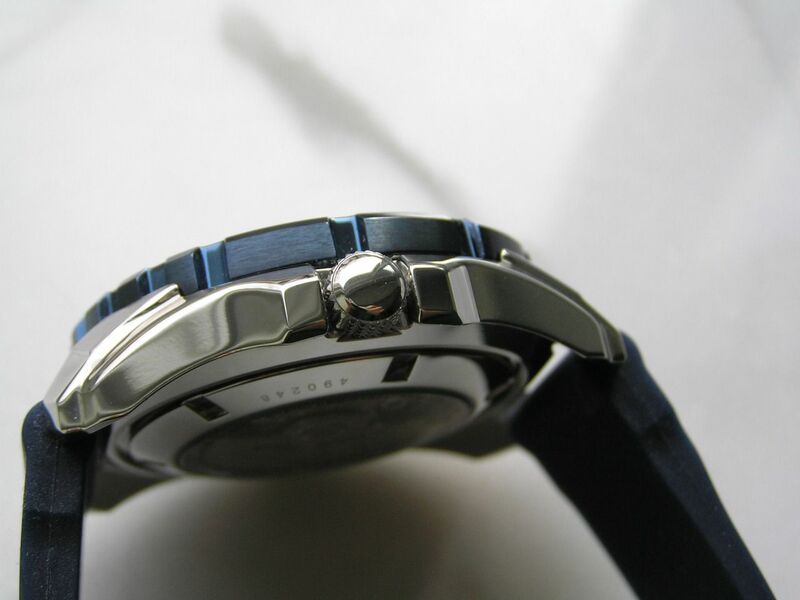 The movement also has a 4,800A/m (60 gauss) magnetic resistance. The watch winds and sets with no problems and turned in a good 44.25 hour power reserve during my testing. Accuracy is not a strong point, as to be expected, with this example running at -19 seconds over 24 hours in the crown up position. The movement can be regulated, but even though this performance isn’t the best, having hacking and manual winding in a Seiko at this price helps compensate for the less than stellar accuracy. Even though this watch features a display back, the movement is really nothing to look at in regards to finishing. Standard machining, no perlage or other decorations and a plain jane rotor, although the rotor is signed ‘Seiko’. 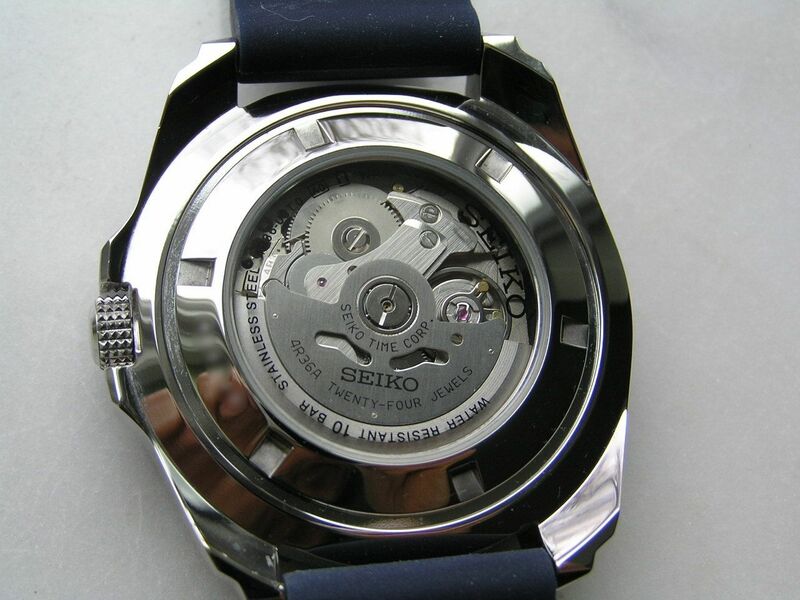 Overall, I find this movement to be a big step forward over the 7S26 and its variants, so kudos to Seiko for finally joining the rest of the hack/manual wind party. 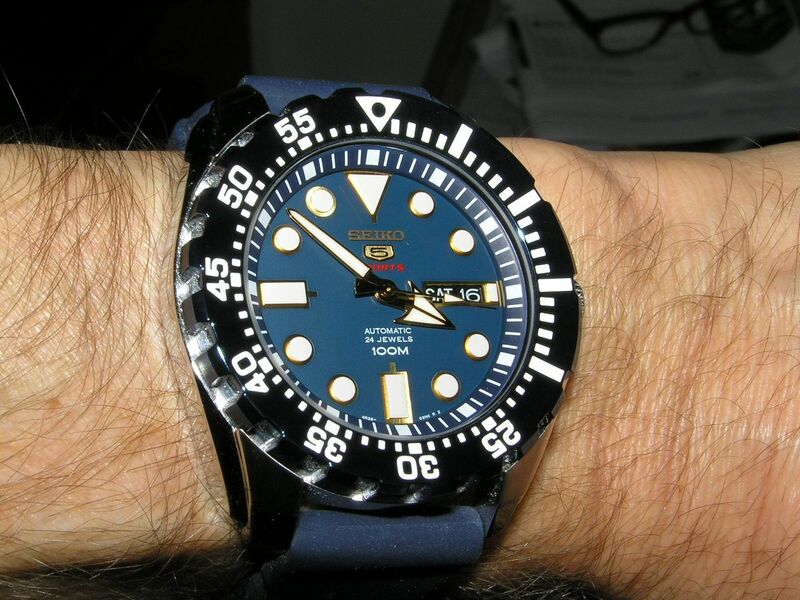 This Seiko 5 Sports came on a stainless steel bracelet, which I changed out for a smooth aftermarket dark blue rubber strap, which I feel looks great on the watch and really compliments the dark blue dial. The bracelet is pretty much standard issue Seiko, which is to say, acceptable. There are no solid end links and the links themselves, while appearing to be solid links, are actually thinner solid links that are folded over to look like a thicker solid link. 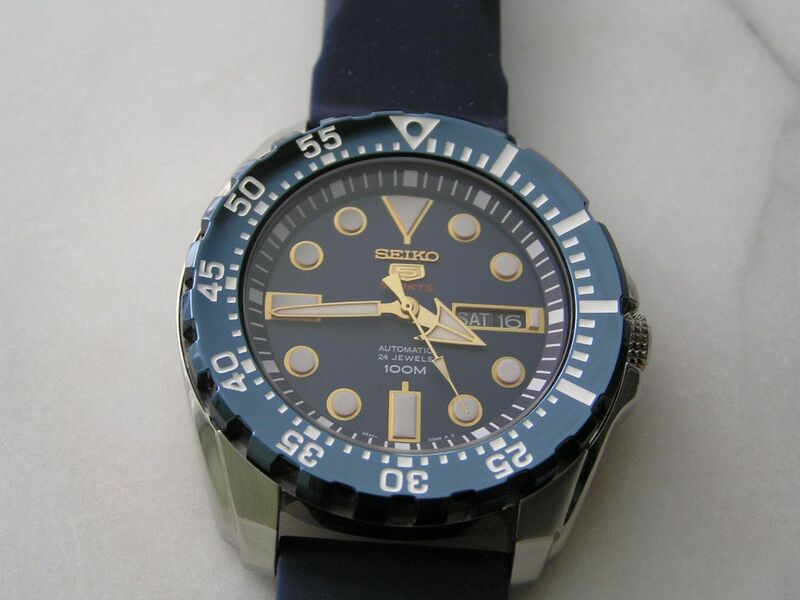 Why Seiko does this I cannot explain, but it has got to be cheaper. 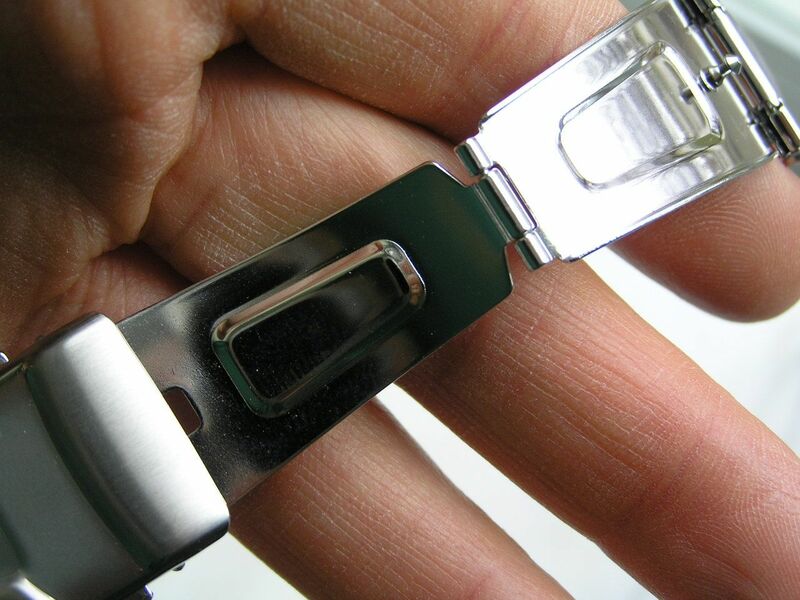 The bracelet is brushed with polished edges and you can see the faint line where the links are folded when you look at the edge. 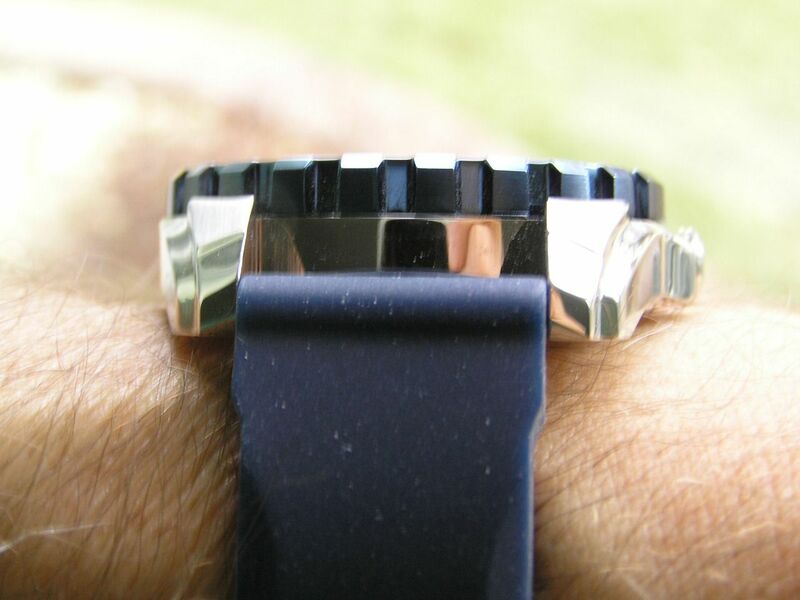 The bracelet measures 22mm at the lugs and tapers to 19.8mm at the double locking signed clasp with pushbutton deployant. 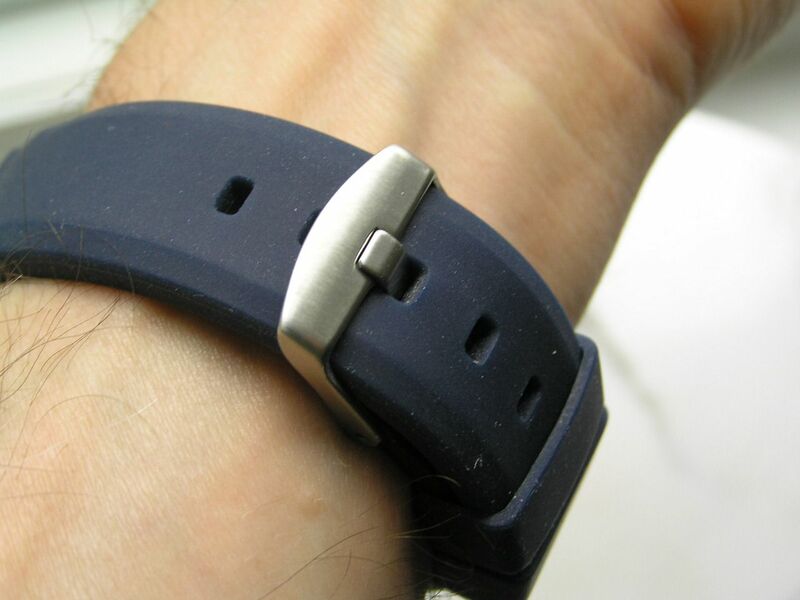 In keeping with the somewhat budget nature of the bracelet, the deployant is rather thin stamped steel. 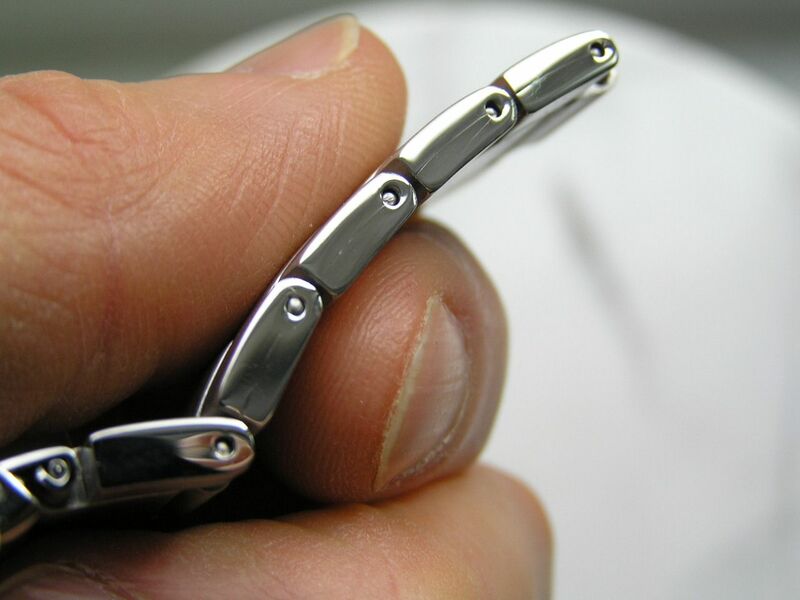 There are four micro-adjustment holes on the clasp to fine tune the bracelet fit. The bracelet can be a bit noisy, but it does get the job done, I just felt that the rubber strap looked better on this model, so hence the change by me. The watch wears well and is comfortable, despite its fairly robust dimensions. Presentation is completely middle of the road. A plain white cardboard outer wrap with a black hard plastic watch box. The box has a slide out drawer on the bottom that houses the instruction manual and warranty cards. Nothing exciting or special here regarding this presentation. The Seiko 5 Sports line certainly delivers a lot of watch for the money. The addition of a hacking and hand-windable movement brings this watch into an entirely different strata and makes this watch an even stronger value proposition than before. The model reviewed here exudes a look that is both classy and sporty and would be a worthy addition to any watch lover’s collection. Verdict: the Seiko 5 Sports is a terrific watch that will last for years and deliver performance and good looks without costing a ton of money. You can’t go wrong with this series, especially with the upgraded movement.